This press release contains information about Night Prayer, the sixth and latest monastic mystery book in Brother Bernard Seif's Office of the Dead series. This document provides information about both the book and the author, along with contact information. From the Office of the Dead. BRODHEADSVILLE, PA – The sixth book in a series of monastic mysteries takes readers all the way to China. 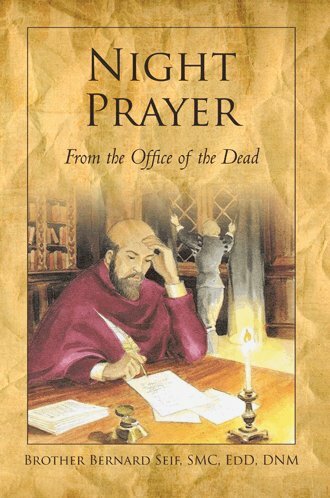 Night Prayer: From the Office of the Dead (published by iUniverse), by Brother and Doctor Bernard Seif is a captivating blend of historical events wrapped together in mystery. A centuries-old cycle of fear and death spans Asia, Europe, and America and it falls upon the shoulders of a simple Christian monk to break the spell. Sixteenth century France bursts to life for twentieth-century Brother Francis through ancient parchments that have come into his hands—along with their dangerous legacy. The clinical psychologist and Chinese medicine doctor has devoted his life to studying the lives of his monastic founders, Jane de Chantal and Francis de Sales. Both revered for centuries as models of spiritual friendship, Jane de Chantal was a wife, mother, widow, and revolutionary foundress who was extricated from her difficult life by the empowerment of a French bishop, Francis de Sales. Some of the events in Night Prayer: from the Office of the Dead are based on historical fact and characters. Seif’s readers love his blend of spirituality, natural medicine, clinical psychology, and Asian culture which abounds in every one of his books. Night Prayer has an added bonus. It includes a series of photographs which adds extra life to the text. Brother/Doctor Bernard Seif, SMC, EdD, DNM, is a Catholic Christian monk with private monastic vows. He is also a vowed and knighted member of the Sacred Medical Order of the Knights of Hope. After earning his doctorate in counseling at Lehigh University in Bethlehem, Pa., Brother Bernard was licensed as a clinical psychologist in Maryland and Pennsylvania. He later became board certified in Behavioral Medicine and is also a doctor of Natural Medicine with a specialization in Chinese Medicine. Night Prayer is the fifth book in Seif’s series of monastic mysteries. Other titles include Office of the Dead, Vigils, Morning Prayer, Daytime Prayer, and Vespers. This press release contains information about Vespers, the latest monastic mystery book in Brother Bernard Seif's series. It provides information about both the book and the author, along with contact information. Vespers: Evening Prayer from the Office of the Dead. BRODHEADSVILLE, PA – The fifth book in a series of monastic mysteries takes readers to the lush “garden island” of Kauai, Hawaii. 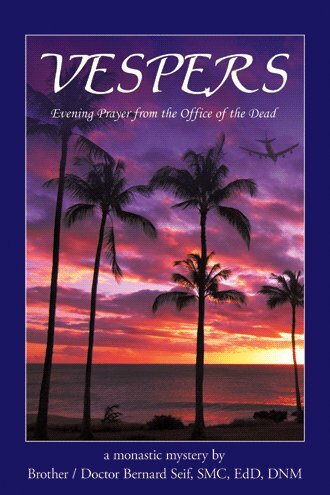 Vespers: Evening Prayer from the Office of the Dead (published by iUniverse), by Brother/Doctor Bernard Seif is an intriguing look at monastic life where not everything is as it seems. The Abbot of the Salesian Monastery in the Pocono Mountains of Pennsylvania is preparing to leave for one of his trips. This time Brother Francis is headed to the island of Kauai, where he will present a workshop and minister as a clinical psychologist and doctor of natural medicine. But during his stay, Effie, the psychic wife of a Daoist named Mister Wu, is murdered, and the frequent-flyer monk soon discovers there is a fine line between spirituality and magic. Meanwhile, back at the monastery, Brother Benedict loses his battle with a long illness. As if coping with the death of one of their own weren’t enough, the monastics must also deal with a peculiar visit by a pair of CIA agents. Sister Jane de Chantal, who is taking care of things while Brother Francis is away, must help her charges through this difficult time while trying to learn if their visitors are friend or foe. Readers of all ages laud Seif’s monastic mystery novels as informative reading wrapped in an enticing murder mystery. Though the books don’t feel instructive, they are full of details about life in a monastery, meditation, clinical psychology, Chinese and Natural medicine, and travel to other locales. This latest installment is sure to please audiences as well. Brother/Doctor Bernard Seif, SMC, EdD, DNM, is a Catholic Christian monk with private monastic vows. After earning his doctorate in counseling at Lehigh University in Bethlehem, Pa., Brother Bernard was licensed as a clinical psychologist in Maryland and Pennsylvania. He later became board certified in Behavioral Medicine and is also a doctor of Natural Medicine with a specialization in Chinese Medicine. Vespers: Evening Prayer from the Office of the Dead is the fifth book in Seif’s series of monastic mysteries. Other titles include Office of the Dead, Vigils from the office of the Dead, Morning Prayer from the Office of the Dead, and Daytime Prayer from the Office of the Dead.